The Belfast Giants lie four points behind Elite League leaders Nottingham Panthers after a 5-4 victory over Hull Stingrays at the Odyssey Arena. 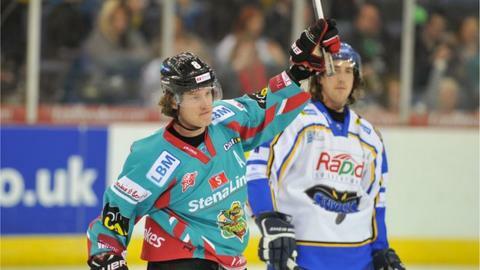 Robby Sandrock (2), Kevin Saurette, Gregory Stewart, Colin Shields were the goalscorers for the Giants. Nottingham retained their lead at the top thanks to a 6-2 win over Coventry and the Giants now play Cardiff away on Sunday night (18:00 GMT). The Panthers meanwhile travel to take on Sheffield.